SavingSports has recently published statistics showing that both boy’s swimming and wrestling participation numbers have declined in California high schools. Many people may be surprised to hear that football has suffered the same downturn in total players. The pressure to comply with Title IX’s gender quota will only get worse if compliance standards are not changed soon by the US Department of Education. High schools that feel threatened by potential lawsuits, if they do not have a 50-50% gender ratio among all their athletes, will react by cutting male players. 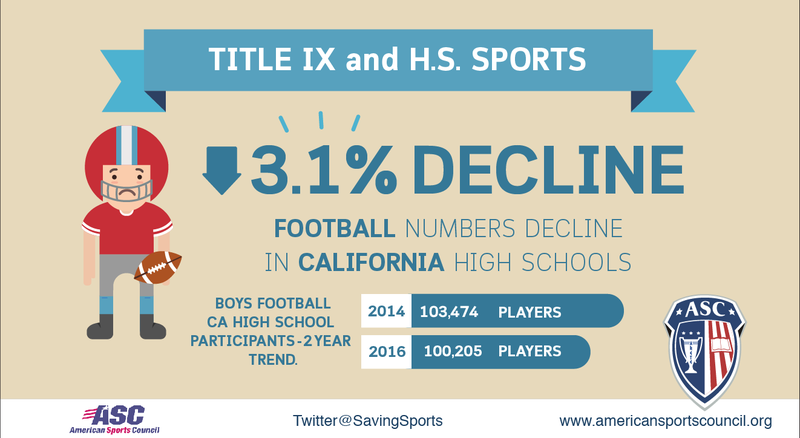 The statistics for football, swimming, and wrestling are all showing declines in participation rates for boys in California where the Ollier v. Sweetwater Union High School District Title IX ruling by the US Court of Appeals Ninth Circuit has legal jurisdiction. No Replies to "Football numbers decline in CA high schools"